Hello this time I am gonna share my experience about how did I enable sound in my ‘low budget’ hackintosh PC. My on-board audio in my motherboard which is MSi G31 TM-P21 LGA 775 is Realtek-alc888. You may need to know that it works after a few times trial and error before it’s really works. I’ve never succeed with Patched AppleHDA method, so I use VoodooHDA kext. I know by using voodooHDA makes my hackintosh not pure vanilla, but it works anyway. Maybe this will not work for all machine, but you can give it try. Please take note before you do this! proceed this at your own risk! as you know that sometimes VoodooHDA can cause system unstable on some machine. Important! before installing VoodooHDA its better to disable Apple SIP. This can prevent machine from unwanted error. If you are following my guid of installing hackintosh and using the config.plist I given then Apple SIP was already disabled. Okay! back to the point, below is how to disable Apple SIP if you are not follow my guide. Okay, to do it first you need to find for known VoodooHDA that works with your machine, in this case you can always asking uncle google. 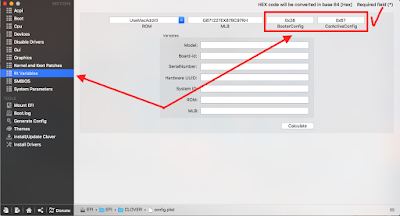 When you finish downloading the kext, before installing voodooHDA you need to delete Apple HDA kext from S/L/E. To do that go to System > Library > Extension and find for AppleHDA kext but important! before you delete AppleHDA backup it first by copy and put it on a safe place, just in case! And after you delete the original AppleHDA kext in S/L/E folder, Install Voodoo HDA and then reboot your Computer. If you are lucky your audio should work now! It’s never happen to my hackintosh but.. just in case if you cannot boot your hackintosh after installing VoodooHDA don’t panic, this is not the end of the world! Just boot in safe mode and delete VoodooHDA kext from System > Library > Extension also delete VoodooHDA Prefpane from System Preferences. Or if your Hackintosh is dual boot with Windows, on boot section, logon to windows instead of Mac OS and delete VoodooHDA kext in Mac OS X-SLE using Transmac from Windows OS. I’ve test it’s work in macOS Sierra, El Capitan, Yosemite and Snow Leopard, doesn’t work in Mavericks, Mountain Lion, and Lion (causing system freeze). As I have mention above! even if you succeed with the sound, VoodooHDA maybe cause system unstable on deferent machine, but on my low rig hackintosh everything is fine, so if you can deal with the risk go ahead and try it your self. For conclusion and you to taking note that every Hackintosh thing is only just for “fun” and Educational purpose only, If you really love Mac OS X system you should buy a Real Mac by Apple. BTW! Thanks for stopping by! good luck & regards!